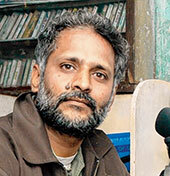 Shri Prakash is an activist film maker working in Jharkhand in India. “I try to use audio visual medium as tool for social change”, he says. “I have Done many documentary films, got screening and recognitions national and international levels.” Prakash now entered in to fiction film making. His first fiction BAHA got one award abroad. Shri Prakash é um cineasta ativista trabalhando em Jharkhand, na Índia. "Eu tento usar o meio audiovisual como ferramenta para a mudança social ", diz ele. "Eu tenho feito muitos documentários, exibidos e reconhecidos nacional e internacionalmente”. Prakash agora começa a fazer ficção. Sua primeira ficção é BAHA que ganhou um prêmio no exterior. (Gere Dan) India, 2014, 48 min, French/English with English subtitle World premier in NewYork City Niger, Gabon, Congo and other African countries had been going through the experience of Uranium mining since decades. But now more and more Uranium mining companies are going to Africa more aggressively. Poverty, lack of governance and political instability has made this area as heaven for these mining companies. This film is trying to looking from inside of a tiny village 'Falea' in Mali where drilling for prospecting of uranium is going on, and same time also try to see the multiple dimensions of the uranium mining and vested interests of world powers in that same sub-Sahara region. Both filmmakers are present (New York 2014).